And a whole host of other useful (if you're a network engineer) documents. Linux afficionado - though by no means an expert. 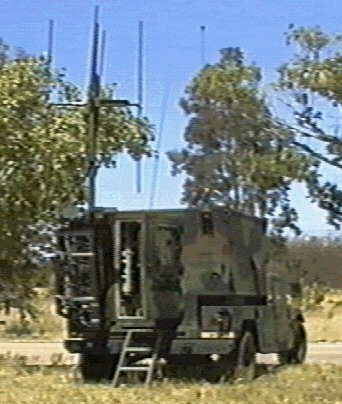 The "Turkey 32" is a truck-mounted radio direction-finding system. Back in the late '80s and early '90s, it was mounted on the back of a CUCV (basically, a mil-spec Chevy pickup with a power take-off bolted to the transmission.) Nowadays, of course, it goes on a Humvee. The very efficient air conditioner mounted on the electrical equipment shelter made this a good vehicle to be near in hot weather - good place to keep the beer sodas cold. The PRD was a man-portable radio direction-finding system (well, more like 3- or 4-man portable system) used by Low-Level Voice Intercept (LLVI) teams in very close proximity to the front lines - with no guarantee whose side of the lines you'd be on, either. The picture here doesn't show it, but that antenna stands about 9 feet tall and weighs about 50 pounds. So for a typical "insertion" mission (that is, you hike to your site or get dropped off by helicopter), you have each team member carry 1 of the system components, batteries, a three-day supply of food and water, personal weapons, cold-weather gear if necessary, and so on. As the biggest guy in my team, I carried the antenna. And as the team leader, I also carried the radio.